If you've used other logging apps you will notice that maybe their programs feel a little rushed or prepared by people that are not experts. We noticed too, so that's why we only have routines designed by award winning personal trainers. Three of these trainers include: MyFit's Head Trainer Rod Ferris CPT (ACE, YMCA), CFC, CPAFLA , Professional Fitness Model Artus Shakur and WBFF PRO Vince Del Monte. We have a huge database of exercises with instruction and animations and you can search and add all of these exercises by letter, muscle, equipment, type of exercise or a combination of these. It makes creating routines very easy. You can even create your own personalized exercises that are searchable through this feature, and that can be backed up to our server. Sometimes you need a little instruction on how to perform an exercise properly. We have a quick view button (View Ex) during logging that allows you to view all the details regarding the exercise. Our entire app is focused on making logging your exercises the easiest it can be through easy log auto-saving, viewing instructions, setting goals, adding notes and editing the number of sets. We also have auto start rest timers(with alarms or vibration). During logging we showyou the correct amount of reps to do and weight based on your previous logs. We also show you your log history, and a progress chart all in ONE screen. That's functionality. I'm sure you've used a logging method on the iPhone at this point, and if you haven't, you're in for a treat. Myfit has enabled auto change exercise after completing an exercise for super setting and circuit training. Pro Only: All routines have a certain goal for the number of repetitions you perform. We make this mindless by actually showing you your goal before you enter it into the logging screen. Note: Pro only. Why wouldn't you get the latest exercises and fitness workout plans that Myfit Personal Trainers approve? That's what we thought; so we made it happen. Every time you sync your phone with our website it goes and finds all the exercises and routines for you. While inputting your reps, weight or distance, intensity and heart rate (for cardio) into the app is easy, it would still be a bummer to lose that information. With our app you can upload your data to our website for safe keeping. Over 275 of the most utilized weight training exercises. Built-in exercises are also automatically updated through the sync option. 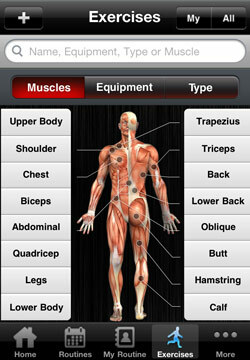 You can also search through these exercises by the handy abcdef.. scroller, a search bar, by equipment, by muscles, or by type. Also, with over 50 workouts and the ability to be increase through syncing, this app is a must for any level of athelete or exercise enthusiast. Why not have the ability to show how you're doing with regards to your 1 rep max on all your active exercises? What about showing your minute mile times for your cardio exercises? What's that? What about cardio exercises that aren't able to show a minute mile time? We have an average heart rate over time graph. These stats also include body stats which shows your body measurements over time. Wouldn't you love to see your body fat percentage decrease while seeing your weight stay the same? You owe it to yourself to download this app for free and Pro (for $1.99) gives you immediate feedback through our unique MyFit Scoring system and the ability to share workouts, challenge and more.